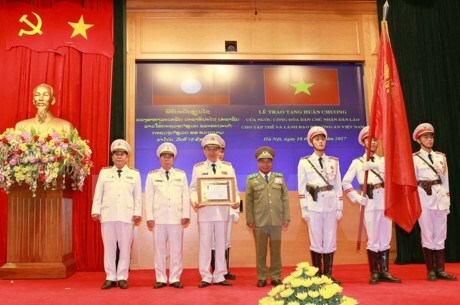 Hanoi (VNA) - Vietnam’s Ministry of Public Security was honoured with the Lao Order at a ceremony held in Hanoi on August 18. Lao Minister of Public Security Somkeo Silavong, authorised by the President, awarded the first-class Development Order for the Vietnam’s Ministry and the second-class Labour Order for Vietnamese Deputy Minister of Public Security Bui Van Nam for the ministry and Nam’s contributions to ensuring safety for the political events in Laos in 2016, particularly the 28th and 29th ASEAN Summit. Addressing the event, Minister of Public Security To Lam said the recognition is the highest award the Party and the State of Laos has presented for the collectives and individuals who made significant contributions to developing and strengthening the traditional, special friendship and comprehensive cooperation between the two nations. It also reflects that the Party and the State of Laos highly appreciate the staff and leaders of Vietnam’s Ministry of Public Security, he added.